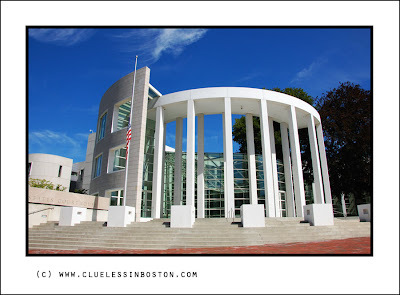 United States District Court, Springfield, Mass. great angle and such a blue sky to contrast with the white interesting building. Thanks for your comments on my site. I posted a mare and colt on my site today to start a series on my website from my photography tour. It was quite an interesting trip to the slot canyon and Vermillion Cliffs. Also, if you like travel photos, we have posted action photos from Buenos Aires, Argentina on our travel photo site, www.vivalavoyage.com. Have a good week! So modern building and I loved this clean style! Looks like some fabulous lines here. Exciting building look! Interesting architecture. Our Federal Building is "different" looking as well. Exciting architecture, encircling, inviting. And this is a really great capture of it. What an interesting design! Love that beautiful blue sky too. Any idea as to who the architect might be? Great photo. Must be a nice place to work at! Wow, that's a fantastic-looking, very modern courthouse! Very modern and quite impressive. Wow, that's a cool looking building!